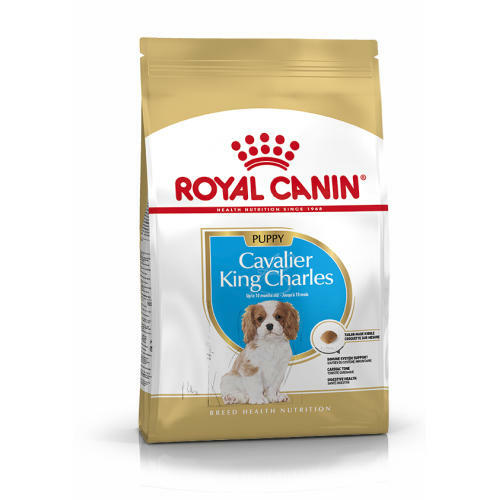 ROYAL CANIN Cavalier King Charles Junior Dry Dog Food is both scrummy and nutritious! Growth is an essential stage in your King Charles Cavalier puppy’s life. During this key period, your puppy’s immune system develops gradually. That’s why it’s important to select a food that provides your dog with nutrients that support optimal health. Suitable for puppies up to 10 months old, ROYAL CANIN Cavalier King Charles Puppy is specially formulated with all the nutritional needs of your growing puppy in mind. ROYAL CANIN Cavalier King Charles Puppy contains a patented complex of antioxidants that help to support your puppy’s natural defences as its immune system develops. Enriched with Omega-3 fatty acids (EPA and DHA), as well as an adapted content of minerals, ROYAL CANIN Cavalier King Charles Puppy contains all the nutrients necessary to help support healthy cardiac function. This formula contains a specific combination of nutrients with high quality protein (L.I.P.) specifically selected for its high digestibility. What’s more, ROYAL CANIN Cavalier King Charles Puppy contains exclusive, tailor-made kibble. The exclusive formula contains a calcium chelator which helps to reduce the likelihood of tartar formation on your dog’s teeth and gums. Immune system support - Growth is an essential stage in your dog’s life: it is the time of big changes, discoveries and new encounters. During this key period, the puppy’s immune system develops gradually. CAVALIER KING CHARLES PUPPY helps support your puppy’s natural defences thanks particularly to a patented* complex of antioxidants including vitamin E. *France, patent No EP1146870. Cardiac tone - CAVALIER KING CHARLES PUPPY contains the nutrients necessary to help support good cardiac function: adapted content of mineral, EPA & DHA, taurine, L-carnitine and antioxidants. Additives: Vitamin A: 30500 IU, Vitamin D3: 800 IU, Vitamine E: 630 mg - E1 (Iron): 38 mg, E2 (Iodine): 3.8 mg, E4 (Copper): 12 mg, E5 (Manganese): 50 mg, E6 (Zinc): 104 mg, E8 (Selenium): 0.07 mg - Taurine: 2.2 g, L-carnitine: 400 mg - Technological additives: Clinoptilolite of sedimentary origin: 10 g - Sensory additives: Yucca extract: 125 mg - Preservatives - Antioxidants. Composition: Dehydrated poultry protein, rice, maize, animal fats, vegetable protein isolate*, beet pulp, maize flour, hydrolysed animal proteins, maize gluten, minerals, fish oil, soya oil, fructo-oligo-saccharides (0.34%), hydrolysed yeast (source of manno-oligo-saccharides), yeasts extracts (source of betaglucans), borage oil, marigold extract (source of lutein). *L.I.P. : protein selected for its very high digestibility. Crude ash: 7.6%. Crude fibre: 1.5%. Crude oil fats: 18%. Moisture: 0%. Protein: 30%.